Last fall, my students were growing frustrated that I could read entire novels in one week of 15-minute-a-day reading sessions at school, so they challenged me to the thickest book they could find on my shelf. The book was Prep by Curtis Sittenfield, and it was definitely a challenge... but not because of its length. Sure, the cover is pretty enough. But always remember: don't judge a book by its cover. 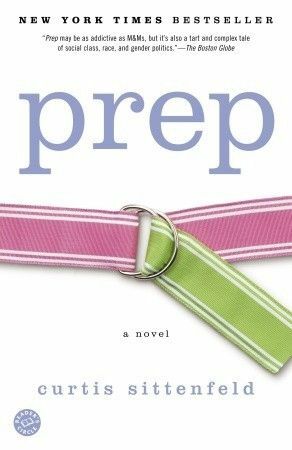 Prep is a novel about a teenage girl, Lee Fiora, who decides she wants to go to a boarding school called Ault. While at first I thought Lee would be much like Holden Caulfield, the narrator from The Catcher in the Rye, a book that is near to my heart, I soon became mistaken. Rather than the humorous charm I always get from Holden, Lee's character is just plain whiney. Though I didn't necessarily want to, I forced myself through all 450 pages. Lee goes off to a boarding school. She doesn't like it. She doesn't fit in. She makes awkward friends. She loses said friends. She meets a guy and falls for him. She enjoys school a bit more. She graduates and moves away. The end. But seriously... I don't like being critical of novels because I know how much work goes into writing them. And I did find plenty of glowing reviews for this book on Goodreads. It just wasn't my cup of tea. Some of you may enjoy it, though!